Home / Africa / Business / Can Bill Gates' donation of 100,000 chickens help Africa's poorest? Can Bill Gates' donation of 100,000 chickens help Africa's poorest? 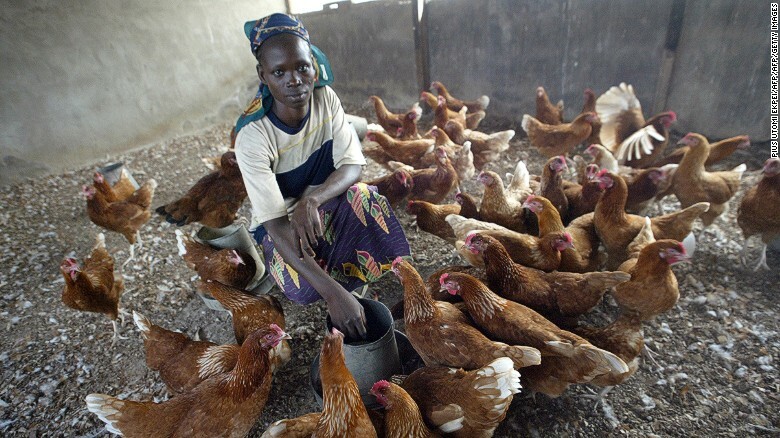 chickens in Sub-Saharan Africa, in hopes of helping reduce poverty. Bill Gates is renowned for his philanthropic work, but the billionaire's most recent campaign is out of the norm: he's promised to donate 100,000 chickens to countries with high levels of poverty, mostly in sub-Saharan Africa. Chickens are easy and cheap to take care of, they keep children healthy and they empower women who sell chickens and are likely to reinvest the profits in their families, wrote Gates on his blog in June. "It's pretty clear to me that just about anyone who's living in extreme poverty is better off if they have chickens," said Gates. Raising and then selling chickens can help families out of poverty, he believes. A farmer with 40 chickens has the potential to make over $1000 a year, versus the extreme poverty line of about $700 a year, according to Gates. The Microsoft co-founder said his goal is to help 30% of the rural families in sub-Saharan Africa raise improved breeds of vaccinated chickens, a vast improvement from the 5% currently. Families that keep chickens can use them either for their own meat or sell them. Gates also wrote that eating more eggs, rich in protein and other nutrients, can help fight malnutrition, and many farmers with small flocks find that it's more economical to let the eggs hatch, sell the chicks, and use the money to buy nutritious food. On her blog, Melinda Gates added that chickens are a good source of income, known in international development circles as "the ATM of the poor," because they are easy to sell on short notice to cover day-to-day expenses. The chickens will be given away through the charity Heifer International, which will oversee the breeding and distribution. While this is obviously positive news for some, this initiative may only benefit some people on a small scale, said Feyi Fawehinmi, a Nigerian accountant based in London. "I've spoken to a few farmers (in Nigeria) and they all tend to stop at a point as it's hard to grow any further without serious investment," he said. "Almost everyone reared chickens growing up. We usually reared a few some months before Christmas when I was growing up, and then sold them for a profit at Christmas. Many people continue to do this now," said Fawehinmi. "If Bill Gates' goal is simply to help a small number of people own some chickens, that should be fine and it will work. However, if some want to expand, hopefully they will get the required support to do so," added Fawehinmi. "So Bill Gates' plan is not new or novel but it is most welcome." "I value this initiative," said Moussa Seck, chairman of the Pan African Agribusiness & Agroindustry Consortium, who has spent the past 25 years trying to increase and improve farming systems in Africa. "The first step is never too little. One chicken will make 10 chickens. What is important is that they (farmers) can grow," said Seck. "Africa is hungry in a world that has never been so rich. Africa is still facing hunger, so I encourage any initiative," he said. Africa today has over 1.2 billion people and produces 800 million tons of food. Based on Seck's model of each person worldwide eating one ton of food a year, Africa currently has a food shortage of 40%. "The heads of states agreed in 2014 to eradicate hunger by 2025. Hunger is something that humankind can support," he said, adding that Africa's climate is very conducive to growing all the crops available anywhere else. "What Bill Gates is doing is so positive. You can't accept hunger in a world that has so much (wealth). It's unacceptable," said Seck. Others have reacted less favorably to the announcement: Bolivia, a South American country also included in the plan, has rejected the offer.